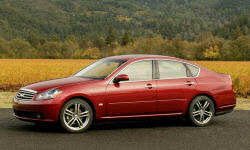 Why the 2006 Infiniti M? I like the balance, via the longer nose. Very classy, and aftermarket summer wheels add. The car is designed to be closed window with AC. On open window in any rain or window washing always leaks into the car. I like windows open, so this is a pain. Outstanding, and can take a beating from the kids. Used both cars to haul some heavy stones, even putting some in the cockpit, and the Infinti protested less and could handle more when the wheels were close to the wells. The traction controls are much more sophisticated, and it is noticable in terms of control. However, the car seems to be built for heated parking garages. Snow collects in the factory wheels, and throws the balance off more than once a year. Good passenger space. Trunk space is not as good as Grand Prix. Countless complements on the GM when loading, it is remarkably well designed, once fit in a 7 piece furniture set. It can handle much more, but not as much back seat leg room as the infiniti.